Pricing varies based on dates and ages of participants. Day 1: Zoar Gap Rafting - This full-day rafting trip starts at 10:30am, and takes you down a ten-mile stretch of class II and III whitewater. We stop for a picnic-style lunch halfway down the river. For Rafting, expect everything you bring on the raft to get wet! Best options for clothing : bathing suit and/or shorts in the warmer weather, longer pants and sweater made of wool, nylon, fleece, or polypropylene in the colder weather. Sneakers or other shoes that can get wet (no flip-flops or Crocs!) Cotton Clothing such as blue jeans, sweatshirts, or t-shirts, is not appropriate for rafting since cotton keeps you cold when it gets wet. All Guests will be required to wear a Zoar Outdoor issued PFD(Personal Flotation Device) and Helmet. We can take adventurers as young as 10 years old with this package. All guests must be between 70 lbs and 250 lbs. We provide lunch on our rafting trip, but you should plan on providing your own food for all the other meals. We do not use nuts in our food, but cannot guarantee that the ingredients in our meals do not contain nuts or other food allergens. If you have food allergies or other special dietary needs, we strongly suggest you bring your own bag lunch in non-glass containers and we will pack it with the other lunches on your trip. You're also welcome to call our office at 1-800-532-7483 with any questions about the menu. If you intend to bring your own meal, please let us know ahead of time, since we take all of the food for the day out on the river with us, and would need to plan on including your food. How many people usually go in a boat? We generally put 5 to 7 people in a boat, but this doesn’t mean that you need to have a group of 5 to 7 to go rafting. For example, if you’re reserving two people, you may be paired with a party of 4 or 5. If you have a group of 10 people, we would just divide you into two boats of 5 that go out on the water together. We also have two 8-person boats that are sometimes available for this trip. Experience the Berkshire hills from two perspectives. Our Zoar Gap and Zipline Canopy Tour package combines our two most popular activities into the perfect getaway. The standard package includes: Day 1: Zoar Gap Rafting - This full-day rafting trip starts at 10:30 am, and takes you down a ten-mile stretch of class II and III whitewater. We stop for a picnic-style lunch halfway down the river, and the trip wraps up around 4:30 pm. You'll have your afternoon and evening free to explore the local hiking trails or head out to see the surrounding towns. Overnight: Cabin Tent Lodging - Camp out in one of our comfortable Cabin Tents. Each raised platform has a large canvas tent set up on it, with four cots inside, and a small gas grill for simple meals. Make sure you pack your sleeping bag, pillow, and a flashlight! Day 2: Zip Line Canopy Tour - Start your morning with a three-hour tour through the trees. The trip includes 11 zips, two sky bridges, and 3 rappels. Start times for the Zipline trips vary, so make sure to check your confirmation for your start time. For all of our whitewater trips, guests must be able/willing to do the following: Wear a helmet and our personal flotation device (PFD), respond to and follow verbal or visual instruction, roll from front to back in water while wearing a PFD, demonstrate dynamic sitting position (sitting upright), and float with feet up in water. Specifically for our beginner Zoar Gap trip, guests should be able to paddle in the rapids, but with frequent rests. Remain calm, lay flat, and orient their body so their feet are aiming downstream if they find themselves unexpectedly in the water. Our PFDs fit a maximum chest size of 56 inches. If you are doing multiple activities with us, it is best to park in our unpaved lot located at 7 Main St. in Charlemont, MA. Head up the stairs towards the red building. There you will find a guide to direct you to the correct location for your activity. Our campground is a self-check-in after 2 pm on the day of your arrival. Outside of the red building you will find a kiosk with a bulletin board, a map of the campground and a box with check-in slips. 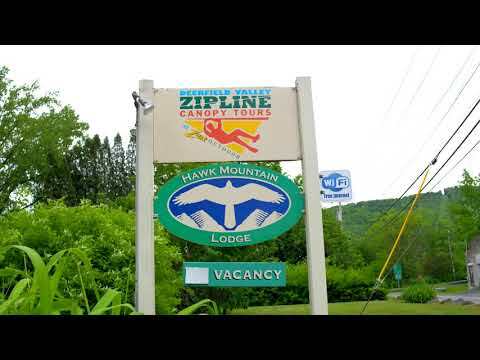 The main base for our zipline canopy tour is located two buildings down and is painted green. Any of our staff members will be happy to help you find your way around! We run our river trips regardless of the weather. In the event of a weather related cancellation, we would make the decision to cancel on the morning of the trip at Zoar Outdoor and would refund the trip in full. River conditions can vary based on rainfall, snow melt, dam operations and other factors. We reserve the right to modify or move a trip or clinic when we deem necessary based on expected conditions. We run our canopy tours in any weather conditions except lightning and high winds. Weather forecasters are notoriously inaccurate, even up to the day of the tour. Therefore, when it is necessary to cancel due to one of these conditions, we will only cancel at Zoar Outdoor just prior to a tour start. In the event that we must cancel due to weather, we will refund your trip payment in full.